HW ‘Bill’ Tilman’s fourteenth book describes three more of those voyages, ‘the first comparatively humdrum, the second totally disastrous, and the third exceedingly troublesome’. The first voyage describes Tilman’s 1971 attempt to reach East Greenland’s remote and mountainous Scoresby Sound. The largest fjord system in the world was named after the Whitby whaling captain, William Scoresby, who first charted the coastline in 1822. Scoresby’s two volume Account of the Arctic Regions provided much of the historical inspiration for Tilman’s northern voyages and fuelled his fascination with Scoresby Sound and its unclimbed mountains. His first attempt on Scoresby had already cost him his first boat, Mischief, in 1968. The following year, a ‘polite mutiny’ aboard Sea Breeze had forced him to turn back within sight of the entrance to the Sound. 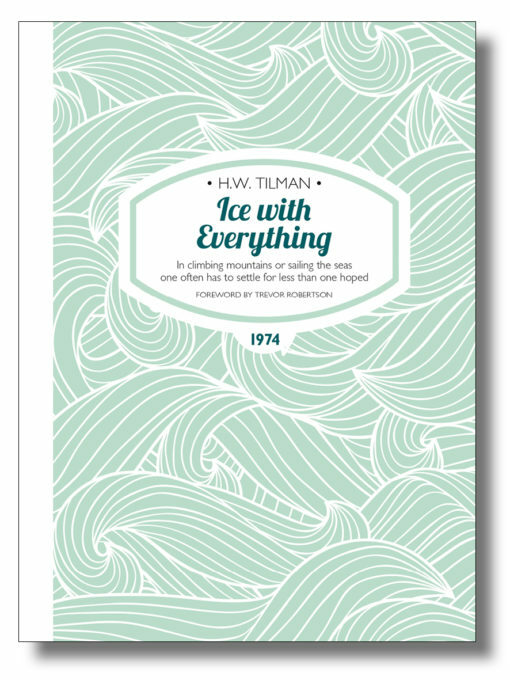 With a good crew aboard in 1971, it was particularly frustrating for Tilman to find the boat blocked once more, this time by impenetrable ice off the entrance to the fjord. He refused to give up; his obsession with Scoresby Sound continued in 1972 and after a series of unfortunate events Sea Breeze ended up between a rock and an ice floe with a failed engine and a disastrous outcome. Safely back home in Wales, the inevitable search for a new boat began. ‘One cannot buy a biggish boat as if buying a piece of soap. The act is almost as irrevocable as marriage and should be given as much thought’. The 1902 Pilot Cutter Baroque, after not inconsiderable expense, proved equal to the challenge after Tilman’s first troublesome voyage in her to West Greenland in 1973. ISBN 978-1-909461-40-6; 216 x 156mm, 160 pages, photos, maps. Softcover with sewn binding, cover flaps and matt lamination.